Ashley Judd is an American television and movie actress. She is the daughter of Country Music singer Naomi Judd and the half-sister of Country Music singer Wynonna Judd. Her television and movie work has led to her being nominated for a number of awards including two Primetime Emmy Awards for Outstanding Lead Actress in a Miniseries or a Movie (Norma Jean & Marilyn and Missing), a Saturn Award for Best Actress (Bug), and two Golden Globe Awards for Best Actress. 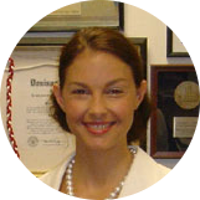 Ashley Judd has also become known for her political activism and global humanitarianism. Ashley Judd’s known famous kin are through her father, so she does not share them with her mother Country Music singer Naomi Judd, or her half-sister Country Music singer Wynonna Judd. These family connections result from her direct descent from Mayflower passenger William Brewster. Other famous kin in her family tree include President Zachary Taylor, poet Henry Wadsworth Longfellow, actress Katharine Hepburn, chef and TV personality Julia Child, C.I.A. Director Allen Dulles, actress Jordana Brewster, singer Pete Seeger, actor Ted Danson, comedian Chevy Chase, actor and singer Bing Crosby, actor Richard Gere, and many others.